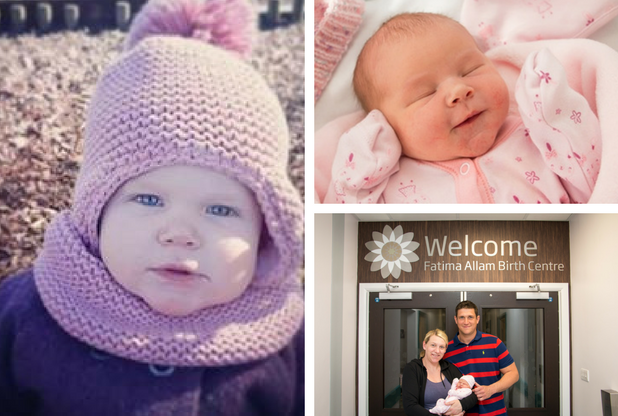 First baby born at Hull’s Fatima Allam Birth Centre turns 1! She was the first baby to open her eyes in the plush surroundings of the Fatima Allam Birth Centre and now one-year-old Connie Houghton is back to celebrate. Arriving at 4.49pm on April 10, 2017, and weighing in at 8lbs 9.5oz, Connie is one of over 340 babies born to date at the city’s £470,000 midwifery-led unit, within Hull Women and Children’s Hospital. Parents Ellen, 32, and Gareth, 34, who also have a son Charlie, now four, hadn’t planned to use the birth centre but agreed to be the first family when Ellen arrived at the hospital in labour. “We had Connie in the Jasmine suite and it was absolutely fantastic. My husband remembers the music playing in the background and I remember the mood lighting. She was born under water and the whole experience was just so calm and amazing. 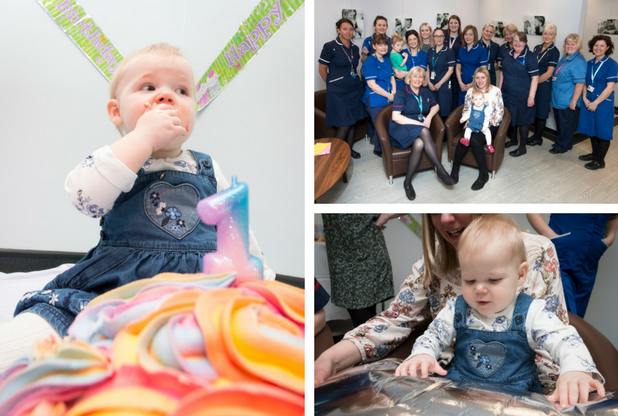 To mark baby Connie’s first birthday, she was invited back to the birth centre to take part in a ‘cake smash’ and celebrate with staff. Work began on the construction of the birth centre in November 2016 after a donation of £370,000 from Fatima Allam and her family. The trust contributed £100,000 to the total cost of the centre. Around 1,400 East Yorkshire women give birth each year without the need for medical intervention, supported by midwives, and the birth centre was created to meet the needs of women with low-risk pregnancies who wish to birth their babies naturally. Although the unit is self-contained on the second floor of the main Women and Children’s Hospital, it was built next to the labour ward to provide swift access to medical assistance in the event of an emergency. With valued input from Mrs Allam, three rooms – Lotus, Jasmine and Persea ­ – were decorated in the style of luxury hotel rooms each featuring a birthing bed, birthing pool, en-suite wet room and muted colour changing light scheme. Faux wood panelling conceals medical equipment, all within easy reach of midwives. Janet Cairns, head of midwifery at Hull University Teaching Hospitals NHS Trust, said: “The Fatima Allam Birth Centre is a fantastic addition to our maternity services and has increased the options available to women when they consider where and how they would like to give birth. “Women in Hull and the East Riding now have the choice of having their babies at home, in a unit led by skilled midwives or with the expertise provided by dedicated staff in the labour ward at Hull Women and Children’s Hospital. 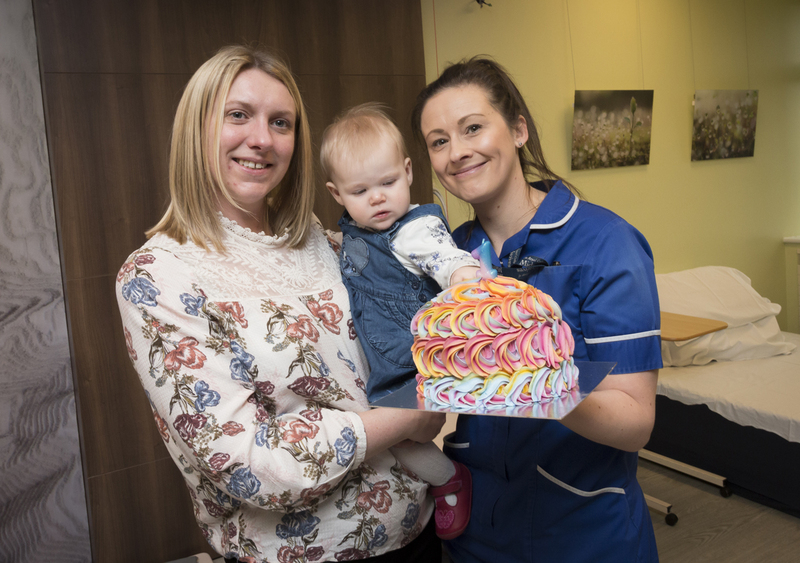 Midwifery sister Suzanna Lascelles, who runs the Fatima Allam Birth Centre, led her team of midwives in the celebrations, organising a special cake smash for 1-year-old Connie as well as balloons and a birthday cake of her own. Suzanna said: “We have had wonderful feedback from the women who have chosen to have their babies at the Fatima Allam Birth Centre. “It is a real gift having it here in our city and we expect the number of women using the centre to continue to rise. “They tell us they’ve had a great experience in relaxing and comfortable surroundings and that was our mission from the start. If you would like to find out more about the Fatima Allam Birth Centre, speak to your midwife or attend one of the monthly HEY Baby Carousel events held on the last Wednesday of every month, 6-8pm, on the ground floor of the Women and Children’s Hospital.